SCARE Productions Inc. is a recognized 501c3 non profit organization. 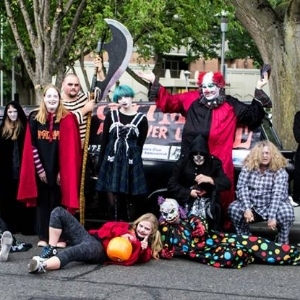 For over thirty years we have put on one of the largest haunted attractions in the Pacific Northwest. SCARE Productions has the best track record of any haunt in the state. SCARE also handles security at Crypticon Seattle, the areas largest horror convention, as well as various fund raising events. The largest and most terrifying haunted attraction in the state. The Nightmare is a 3/4 mile long hike through the monster filled woods of the Sammamish plateau. SCARE actors are not limited to the haunt in October. Our monsters perform year round at events both large and small. We have supplied monsters and make up to Virtual Sports, Tilted Thunder Rail Birds, the Seattle EMP/MoPop and Bumbershoot. As well as many appearances at local events. 2018 Work party info will be announced soon!